our hope which is never put to shame. revealed through Thy wonderworking Icon! to Thy Son, Christ our God, that we may be freed from all evil. and rightly divide the Word of Truth! 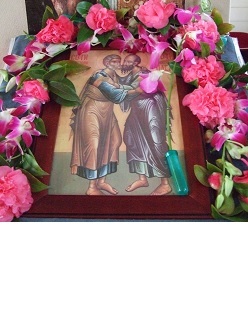 who venerate Thee and pray to Thee before Thy wonderworking Icon! be our Protectress and Intercessor! apart from Thee, Heavenly Queen. and from enemies visible and invisible. Grant us correction of our sinful life, and soften our evil hearts. from lack of faith, from moral decay and eternal perdition. now and ever, and unto the ages of ages. Beginning the sixth week of the honourable fast with eagerness, let us sing to the Lord a pre-festal hymn, bringing palms, O ye faithful, to the One Who comes in glory to Jerusalem, with the power of Divinity to destroy death. Therefore let us piously prepare the signs of victory, virtuous branches, chanting “Hosanna” to the Creator of all. Thou hast taken away the rock of insensitivity from my heart, o Lord, which was being killed by the passions. Lift up my soul, O good One, so that I may bring to Thee the palm branches of virtues. As the Victor of hell, grant me, Master to receive eternal life, singing to Thy dominion and Thy goodness, O only Lover of mankind. Nevertheless, repentance continues to the end of the fast, or indeed, to the end of our life on earth. Christians are required to always fast from sin. I have been morally like the unmerciful rich man, o Merciful Lover of mankind. I pray Thee, group me with Lazarus the poor man, saving me from the flame and the unceasing fire. I have fasted from correction, and have taken my fill of sin, o Lord. Now I hunger - nourish me with saving and honourable food. Let us love the passion-killing fast, and be diligent in prayer. Let us weep, cry and sigh sincerely, so that Jesus may console us and make us partakers of the Kingdom. O Lord, Thou hast granted us to reach the light of the present day, and soon we shall come to the holy week of the dread raising of Lazarus from the tomb. Count us Thy servants worthy to walk in Thy fear, and to complete the whole course of the Fast. With God’s help we have rounded the turning post of the Fast. Let us run the remainder of the course with all our strength, and win a victor’s crown. Tilling the soil of our mind with the divine ploughshare of the Fast, let us reap the sheaf of the virtues: Then we shall not hunger in eternity, but will rejoice in gladness with a joy that has no end. 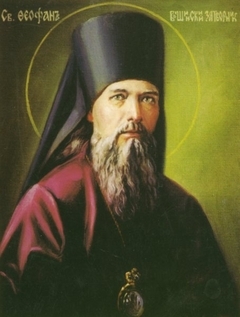 Great Lent is a time during which all Orthodox Christians deepen their spiritual struggle. While fasting and repenting, they prepare for Holy Communion. St Theophan the recluse offers this advice to us for the time between the evening service, at which we have Confession, and the Liturgy in the morning. According to our established order, there is usually a little time between Confession and Communion, most often only evening, morning and Liturgy. During this time it is important to carefully preserve the good frame of mind with which you left the church after Confession, and apply it to your Communion with the Lord in Holy Communion. 1. Preserve your attention undistracted and your heart undisturbed. Take care not to become scattered or anxious over cares, and remove yourself from everything; go within and remain there with one thought about the Lord, Who is able to come to you. Put away all thought processes, and, concentrating on the One Lord, pray to Him with undistracted prayer of the heart. 2. If your thought cannot reside only in this, occupy it with thoughts of Communion itself; and so that it will not stray too much, bind it with the words of the Lord and the holy Apostles about this Sacrament. 3. Contemplate a saying of the Lord or the holy Apostles; glean some edification from them and dispose yourself to contrite prayer. When prayer comes, fall down before the Lord and do not abandon the prayer for as long as it is present. 4. Occupy the evening in this way until sleep closes your eyes. Morning comes. As soon as you come to yourself upon awaking, first of all resurrect your awareness of the greatness of the dawning day. But do not bustle about, do not be distracted with many things; and keep your attention focused on that which is necessary to be with you and in you. Beware! The enemy will be trying to tempt you in every way, to put your soul in a bad mood, to either scatter your thoughts, or generate some displeasure against someone. Attend to yourself, praying to God, and you will escape these stumbling blocks. 5. Entering the church, feel as though you were in the upper chamber at Sion, where the Lord communed his holy Apostles, and heed more than ever what is being sung and read, directing everything to the thought that the Lord Himself is preparing a supper of salvation for you. 6. Warm your faith in the actual presence of the Lord and Saviour Himself in the Mysteries. Going from faith and concentrating on the Lord Himself as if already approaching you, in self-abasement cry out: I am not worthy that Thou shouldst enter under the roof of my house. From self-abasement pass to the fear of the Prodigal Son, not cutting you off, but bringing you to a state of reverent soberness. Inasmuch as the Lord Himself invites you and asks you to approach, be ready to approach with good hope, desire, and thirst, like the deer panting after the Lord Himself, and longing with assurance to receive the Lord Himself, together with all the treasure of life that is hidden within Him. From this longing, which will not be put to shame, again turn to yourself in readiness to meet the Lord, and fan ever stronger the flame of heartfelt contrition, repeating the promise to turn away from sin, even if you have to die doing it. 7. Work hard to stand through the entire service, passing from one of these feelings to another. In this good state finally approach the chalice of the Lord, and upon seeing it, make a bow to the Lord Who approaches you. Opening your lips and heart, receive Him, humbly and reverently calling out with the Apostle Thomas: My Lord and my God! Glory to Thee, O God! Glory to Thee, O God! Glory to Thee, O God! Having approached the chalice of the Lord with such a disposition, and stepping away from it, you will feel in your heart: It is truly said, that having communed of divine grace, I am no longer alone but with Thee, my Christ, the three-sunned Light that enlightens the world. From this moment you will begin to bear Christ within yourself. Take care to zealously guard Him there and hold Him within yourself. If Christ is in you, who can be against you? And you will be able to do anything in the Lord Who strengthens you. Let us set out with joy upon the second week of the Fast; and like Elijah the Tishbite let us fashion for ourselves from day to day, O brethren, a fiery chariot from the four great virtues; let us exalt our minds through freedom from the passions; let us arm our flesh with purity and our hands with acts of compassion; let us make our feet beautiful with the preaching of the Gospel; and let us put the enemy to fight and gain the victory. As we set out upon the second week of the Fast, direct our steps, O Lord: Shine upon us with the sanctifying light of Thy commandments, and make us worthy to offer on bended knees a prayer acceptable to Thee: For Thou art our Father and we are Thy sons. With feast we sing Thy praise and call upon Thy name. Fast, then, by lifting up acts of almsgiving before [God’s] eyes, by doing what you do with love for your neighbour, by being holy. What you take from yourself, give to someone else so that your needy neighbour’s body may be restored by the affliction of your own. The Lord says through the prophet: “What you fasted and mourned, did you fast for Me? And when you eat and drink, do you not eat and drink for yourselves?” He eats and drinks for himself who nourishes his body with the Creator’s common gifts, without regard for the needy; and he fasts for himself if he does not bestow upon the poor what he takes for a time from his own use, but keeps it instead to fill his own stomach later. God sees all our feeble struggles in the present fast, and every good deed we manage to complete with His help and blessing. Be of good cheer, but work, strive earnestly; for nothing shall be lost. Every prayer, every psalm you sing, every good deed, every marriage duly observed, continence kept for God’s sake is recorded…for you shall rise [from the dead] clothed with your own sins, or else with your righteous deeds.